Loudness has been a key issue of conversation in the TV industry round the world for a couple of years and one I have been somewhat vocal on including an article in the Broadcast Magazine Techology Briefing for Nov/December 2012. However now the focus is beginning to shift to radio and music recording. These areas will be discussed at the Loudness Summit at the Royal Institute of British Architects (RIBA) in London tomorrow, which I hoped to be at but I am working with Russ tomorrow on a great job we can’t talk about. There are “multiple issues” regarding loudness in radio, including: analogue (FM) and digital (DAB) transmission; production and distribution; operation by technical staff and non-technical staff such as journalists; and wide dynamic ranges used by classical music stations alongside the heavily compressed output of pop services and while the EBU does not have a specific recommendation for radio, a sub-group has been created for this area with the aim to “answer the radio question with more guidance”. 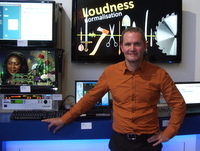 A recent PLOUD meeting also addressed the subjects of avoiding producing low quality audio through the misuse of loudness processors, applying R128 to the music and online worlds and the third version of ITU-R BS 1770, the standard that forms the basis of R128 and other international loudness standards. BS 1770-3 was published in August this year to standardise the implementation of the true-peak metering algorithm and the removal of both the optional DC blocking filter and optional pre-emphasis.